I have recently fallen in love with making curries at home, they are ridiculously easy (saute onion and garlic, add spices, add veggies) and are a really good way to use up all the extra vegetables in the fridge. Last week I was flipping through an Indian cookbook that has more or less languished on my bookshelf and came across a recipe for “Red Pepper, Spinach, and Chickpea Bhaji.” Now, I looked up the term bhaji and it was nothing like the picture with that particular recipe, but I did like the idea of making a curry with a chickpea base (sometimes called channa in Indian cooking, or at least, according to both the index of my book and a quick Google search). 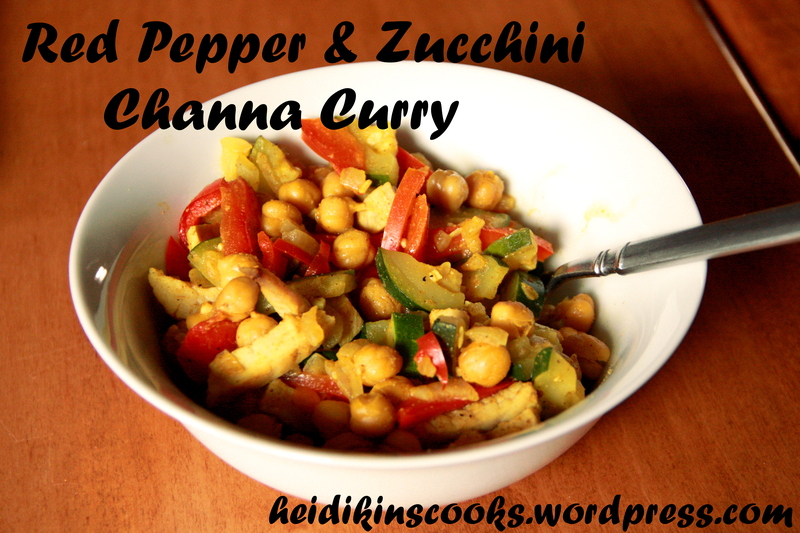 This is what I came up with, and it was absolutely delicious and would be super easy to make as a complete vegetarian meal. Heat oil in large frying pan, add onion and garlic and stir until soft (2-3 minutes). Add all spices and stir another minute or two. If you are using raw meat, add it now and stir until nearly cooked through. Add chickpeas, red pepper, zucchini and broth. Bring to a boil and simmer until liquid is almost gone, 4-6 minutes. If you are using meat that is already cooked, add it now and then heat through and serve with naan or chapatis.